Myra Jehlen and Michael Warner, The English Literatures of America, 1500-1800 (1997). 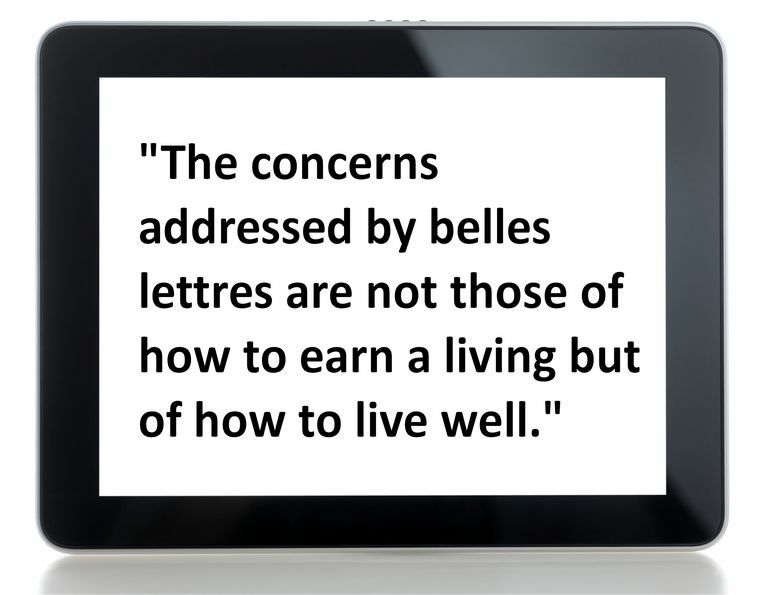 In its broadest sense, the term belles-lettres (from the French, literally "fine letters") can refer to any literary work. More particularly, the term "is now generally applied (when used at all) to the lighter branches of literature" (The Oxford English Dictionary, 1989). Until recently, belles-lettres has similarly been used as a synonym for the familiar essay. Adjective: belletristic. Pronunciation: bel-LETR(ə). From the Middle Ages until the late 19th century, notes William Covino, belles-lettres and rhetoric "had been inseparable subjects, informed by the same critical and pedagogical lexicon" (The Art of Wondering, 1988). Usage note: Though the noun belles-lettres has a plural ending, it can be used with either a singular or plural verb form. "The emergence of a literature of belles-lettres in Anglo-America reflected the success of the colonies: it meant there now existed a community of settlers who took settling in the New World enough for granted not to write about it. Instead of histories, they wrote essays in which style mattered as much as content and sometimes more . . ..
"A piece of prose writing that is belletristic in style is characterized by a casual, yet polished and pointed, essayistic elegance. The belletristic is sometimes contrasted with the scholarly or academic: it is supposed to be free of the laborious, inert, jargon-ridden habits indulged by professors. "[Throughout the 19th century, prescriptions for] fine writing--with their attendant critique of literary style--advanced an influential theory of reading as well. The most influential exponent of this theory was [Scottish rhetorician] Hugh Blair, whose 1783 Lectures on Rhetoric and Belles-Lettres was the text for generations of students. . . .
"Blair intended to teach college students the principles of expository writing and speaking and to guide their appreciation of good literature. Throughout the 48 lectures, he stresses the importance of a thorough knowledge of one's subject. He makes it clear that a stylistically deficient text reflects a writer who doesn't know what he thinks; anything less than a clear conception of one's subject guarantees defective work, 'so close is the connection between thoughts and the words in which they are clothed' (I, 7). . . . In sum, Blair equates taste with the delighted perception of wholeness and posits such delight as a psychological given. He makes this remark by way of connecting taste with literary criticism and concludes that good criticism approves unity above all else.